Is there anything more personal -- and political -- to women than their bodies? Aware of the political charge of their bodies, women have physically hurled themselves in public spaces to protest wars, human injustice, and abuse of power. 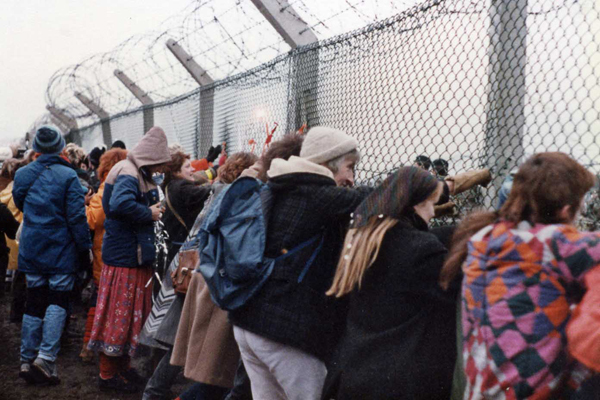 One of the most vivid and longstanding examples of women using their bodies to take up space in non-violent protest is the Women of Greenham Common. From 1981 to 2000, tens of thousands of British women mobilized to negotiate an end to nuclear proliferation in their hometowns. 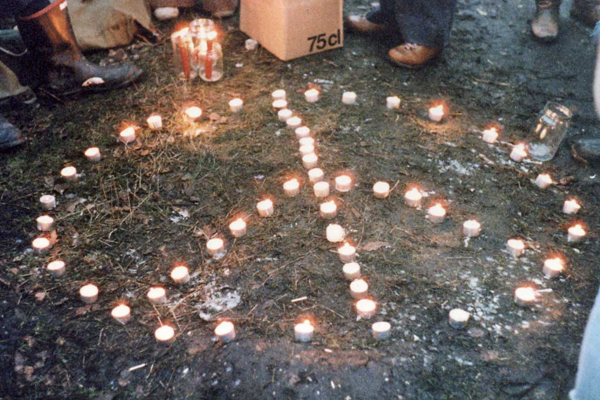 In opposition to the stationing of U.S. nuclear air missiles at the Greenham Airbase in Berkshire England, the Women of Greenham asserted their power by holding hands and creating a fourteen-mile chain around the Greenham Common Airbase with their bodies. Their nearly twenty-year demonstration drew worldwide media attention, garnering the support of millions around the world. The following photographs and accompanying testimonials showcase both the creativity and the positive outcome of women taking up space en masse. 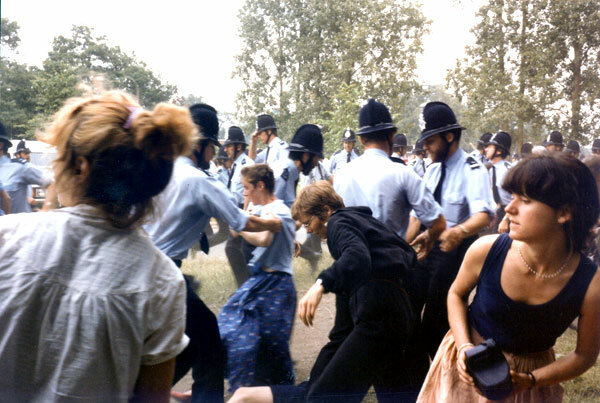 Outfoxing the police seemed to come naturally to the Women of Greenham. Thalia Campbell remembers an action where the women tricked police officers into thinking they were having a Halloweeen Party. Shrouded in black pointy hats, with witches' broomsticks in their hand, they successfully cut down part of the perimeter fence with bolt cutters, leaving the police officers dumbfounded and outnumbered seventy to one. 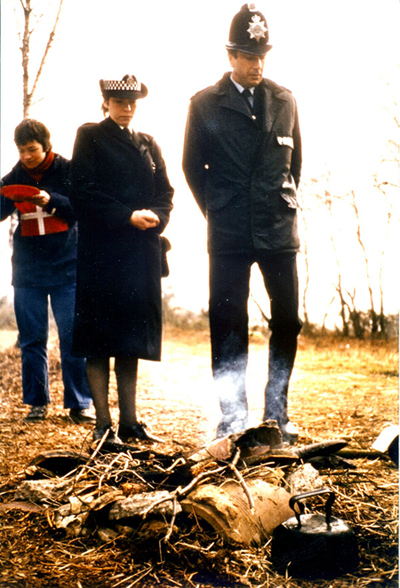 In this audio interview by the Imperial War Museum, Ann Pettitt gives a first-hand account of her experience protesting at the Greenham Common naval base over twenty years ago. She recalls the creative ways in which women were able to outwit the police without resorting to violence, proclaiming, "Non-violent protest, as a form of protest, is much more intelligent isn't it?" The scene is Greenham Common, Newbury, England. Thirty thousand women gather to "embrace" an air force base and protest the housing of U.S. nuclear cruise missiles. "Hand in hand, for nine miles we formed a living chain to lock in the horrors of war," says one woman participant, "to stand between them and our world and say: we will meet your violence with a loving embrace." We just sit down on the ground, or lie down on the ground. The essence of non violence is...that you shouldn't have any violent thing going on between you or the people that are moving you. And that's very, very difficult. I found that separating it out into that physical thing wasn't enough for me. I actually had to prepare myself before I went into an action. It's a strange feeling; it's almost like an out-of-body experience. You go into a higher level of some kind of consciousness and so you can ignore to some extent the pain that you're suffering. Also you can ignore the comments, you know, nasty things like you being nothing but slags and all sorts of that kind of thing. I can remember one time seeing a woman pick up a stone and about four women rushed to her and said "We don't do it that way. We must never do it that way. We're beaten if we ever do it that way. We can stay here forever provided we're not violent." The 'knitted fence' was an organic example of a feminine and feminized piece of protest. It grew cooperatively, tentatively and collaboratively. It was subtle and metaphorical -- not simply adversarial -- like sticking a gun to the enemy's head. It grew the idea of women's wisdom (or even wimmin's wisdom) and it asked questions about the nature of protest. It proposed a generous way of protesting, but it also enabled women to express different opinions from each other and to argue with each other. Vivid in my mind is an event when we were told to take something noisy. I took two saucepan lids. They made a satisfying racket when they banged together, especially combined with the ululation of many women. More exhilarating than even that, was when women started to hold the fence mesh and ever so gently rock the fence. Slowly at first the fence shook and started to sway. We put in more energy and it really got going, wildly lurching back and forth until the whole of our section and other sections, capsized, to great cheers. Carpet bit appeared and were rolled over the barbed wire and in went the bravest women (not me) to the bewilderment of the police and army inside who couldn't cope with the unpredictability of what was happening. It was small-scale, but in so many places at once. The sense of released energy was very liberating. The U.S. missiles left the Berkshire common in 1991. After they were removed, the women stayed to ensure the land would be handed back to the community. In 1997, the land was finally sold to the Greenham Common Trust, whereupon it was passed back to the local council for just £1. The perimeter fences of the old base were taken down in early 2000 and after nineteen years of continuous presence at the site, the women peace campaigners closed down the camp, packed their belongings, and left. The Women of Greenham reconstructed the political activist landscape by claiming the territory surrounding the base as a women's zone. Their story gives us a heightened understanding of the extraordinary possibilities of women's collective leadership.